Built during the height of America’s obsession with cruising the highways and byways, Delgadillo’s Snow Cap Drive-In has been making drivers stop and laugh for over 50 years. 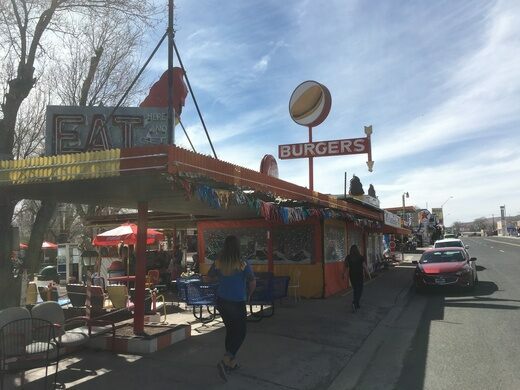 Located on the longest remaining stretch of Route 66, there is no better place to experience the genuine small town hospitality and quirky pride that once defined the Mother Road than Delgadillo’s Snow Cap Drive-In. Originally constructed in 1953 by the now deceased Juan Delgadillo with mostly scrap lumber from a nearby railroad yard, the eatery first gained fame when Delgadillo sliced the top off of his car and began covering it in eye-catching flare such as stickers and a fake Christmas tree. The ramshackle greasy spoon soon became a favorite among locals and travelers down the famous highway. The establishment’s interior restaurant space and outdoor garden still evolves daily. 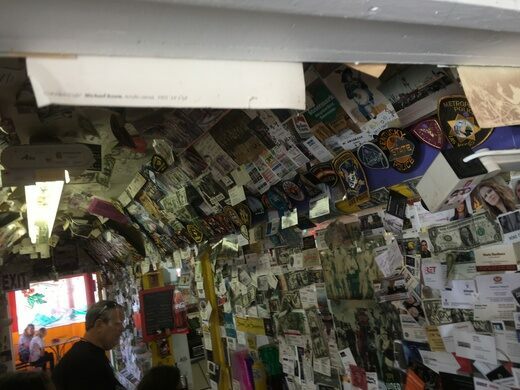 The space is an organic cavern of kitsch, as visitors adorn the structure with foreign money, souvenirs, pictures, business cards, tour guide ID’s, stickers, and a myriad of other pieces of travel ephemera. The walls and ceiling have become a shaggy roadmap of the diner’s history of visitors. The drive-in clearly does not take itself too seriously, but their devotion to jokes and whimsy seeps into every facets of the business. From the front door, which features two door knobs (one’s a fake), to the jokingly redundant menu items (dead chicken, anyone? ), the eatery gives every guest the funhouse treatment. Visitors may have to make a clear distinction between iced tea and iced tee and confirm that they want cheese on their cheeseburgers. Despite dwindling numbers of passersby on Route 66, Delgadillo’s Snow Cap Drive-In is still operated by Delgadillo’s son who keeps the laughs and burgers coming. Bootleggers ran booze beneath this building before (and after) Route 66 appeared beside it.